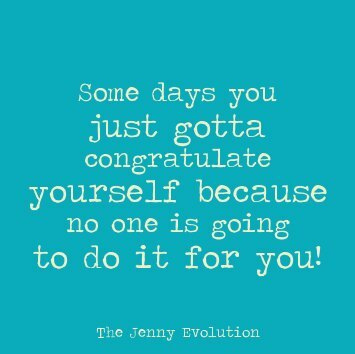 Some days you just gotta congratulate yourself because no one is going to do it for you! As a special needs parent, no one is hosting some grand dinner for you to honor your Outstanding Dedication and Perseverance. Oh no, you have to stop and celebrate that special needs victory! I was thinking of a big win we had when my son Vman, who has Sensory Processing Disorder, was just five years old. We had arrived at a weekend birthday party a little bit late and the place was in full swing. Vman took one sweeping glance at the “dance party” birthday and instantly insisted I sit with him for a while. Initially I was thinking, why can’t my kid just join in for once without any drama? But then the drama didn’t come. He sat quietly and asked me to scratch his back. This from a tactile defensive kid. So he was trying to find a way to acclimate to the loud music and commotion. Hugging or cuddling would have been too much. But today the back scratching was just right. Then he began to get into the groove. He didn’t jump into the group but stayed off to the side, having a great time doing what looked like a Jane Fonda aerobic workout. He excused himself from the room twice, saying it was just getting too loud in there. And this was when I had my Aha moment. He’s finally starting to get when he needs a sensory break and acting on what his body tells him. Yes, this is where you break out into applause! These are the moments we all work so hard for! When our child, even though he may still have sensory issues, is able to identify what he needs and then does what he needs to do to self regulate himself. Now I’m wasn’t kidding myself. This child had cried and cried and cried and cried when I picked him up from school the previous week before he had time to finish looking at a book. He was so upset he couldn’t respond to what I was saying or probably even hear it. Unexpected transitions were devastating to him. So I drove the car with a sobbing child to OT. It’s what we have to do sometimes. But then there are times like that weekend. When I could see into the future, if even for a moment, and know that even though I may not be able to fix my child’s sensory challenges (and other special needs that “popped” up later), I could grasp onto the very real hope that in the end he was going to be okay. As special needs moms, we often are forced to help manage the very real and intrusive challenges our children face. But let’s not forget to celebrate the victories, too. As the mom of The Sensory Spectrum, I get tons of notes from moms almost apologizing to me when they want to “brag” that their child finally ate something other than a chicken nugget or their child was able to sit through a busy event without crumbling from the sound. Why do special needs moms feel like they need to apologize? Why do they need to state that, even though it’s not a “big deal,” they just needed to share? Even though those victories may seem small to others, we know better. We know those victories are a culmination of all of your hard work and tears. We know those victories are a sign of even greater things to come. We know those victories are meant to be celebrated. So crank up the tunes. Post to social media. Or even call that one girlfriend who gets it. Thanks for the feedback. It really does fill my heart to know my experience is echoed back as well as helping others 🙂 Glad you are having your aha moments too. Makes the really bad days (or weeks) seem more tolerable. That’s great! I absolutely love reading your blog posts. I read them everyday. They give me great information, ideas and most of all hope. Thank you!! That’s so awesome to hear! And I’m glad they give you hope. It’s hope that gets us through the day and out of bed the next morning sometimes. Congratulations! That is HUGE progress. I, too, noticed that when my son was about 5, he was learning to take care of his sensory needs outside of school. (During school is an entirely different matter altogether). Thanks for this! As a Mum who has just started this journey it’s such an encouragement to know that one day my daughter may be able to know when it’s all too much BEFORE she has a meltdown! It’s a long journey but a worthwhile one! A favorite quote of mine — a journey of a thousand miles begins with a single step. Just admitting something is wrong and doing something about it is a major hurdle and one of the biggest steps you can take. Keep moving up that mountain! No, but you are so right: we need to recognize and then celebrate when positive growth occurs. What a beautiful reminder that those “little victories” deserve celebrating. Wow, what a heart touching story. Your quote truly spoke to me, and we should applaud each other and ourselves for small victories. Thanks for sharing.